Independent villa, away from everything and everyone. Ideal for those seeking peace. Newly renovated and equipped with every comfort. The house has a bathroom with shower, it is equipped with everything you need, from the dishes to the kitchen to the drying rack, iron, washing machine etc ..... just you bring your suitcase and Lucia thinks of you. L 'exterior is equipped with table and chairs for a good read at' shade of the pine trees and the cool summer maestralino that often accompanies the days Argentario. In the living room can accommodate two people in a comfortable sofa bed. Ein wunderschöner Ort mit einer atemberaubenden Aussicht! Ciao Katrien e Chris, è stato davvero un grande piacere conoscervi! Grazie per aver lasciato la casa perfetta ! Wir haben den leider viel zu kurzen Aufenthalt (nur drei Tage) total genossen. Lucia ist eine sehr hilfreiche, freundliche und sehr sympatische Vermieterin. Wir werden ganz bestimmt wieder kommen !!! Grazie tante a voi, siete stati degli ospiti davero simpatici ed avete trattato la casa la casa proprio come se fosse la vostra! La più grande soddusfazione è quella di ospitare le persone che gioiscono ed apprezzano questo posto proprio come faccio io! Bellissima soluzione indipendente, molto silenziosa e con tanta privacy. dal portico si gode un panorama meraviglioso ed è molto sfruttabile per momenti di relax e per pranzo/cena. Gli interni sono molto ben curati ed arredati. Molto soddisfatta anche della proprietaria Sig.ra Lucia, sempre tanto gentile e disponibile. Grazie tante per me è sempre un gran piacere e una grande soddisfazione ospitare persone che vivono e sentono questo posto proprio come me. Un ringraziamento a Lucia e alla sua meravigliosa casetta. Attrezzata di tutto.adatta a chi a animali noi ne avevamo tre al seguito. Posto unico con vista magnifica. Grazie molte a voi che siete stati degli ospiti squisiti e perfetti nel trattare la casa come la vostra . Per me è una grande soddisfazione sapere che avete cosi apprezzato un posto da me tanto amato..
We stayed for a week in june and it was a perfect holiday -week. You shouldn`t be afraid to drive single trail with your car, because the last 900 m is a small street, but it was no problem, even with our really big car. There are some beaches near by and you reach Porto Santo Stefano and Porto Ecole in about 15 to 20 minutes. We find it the perfect place to relax and calm down and we are sure, that we will return. 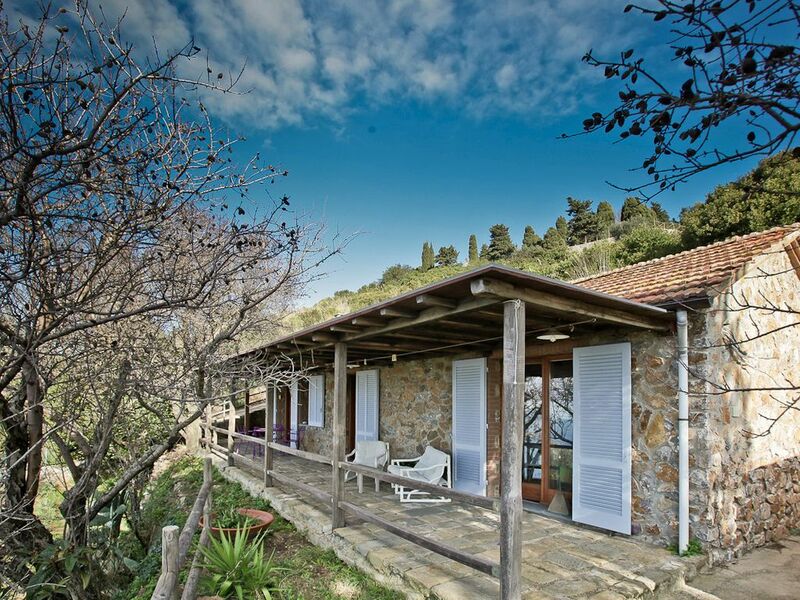 The beautiful holiday home of Lucia and located in the most spectacular of the Monte Argentario, in the countryside overlooking the sea. Breathtaking view where you can see the island of Giglio. The country is 15 min. in the car. Nearby, the most beautiful wild beaches of Argentario, the nearest Cala del Gesso, you'd get 10 min. in most car part of the way on foot. But I assure you it's worth it. then always in the same side of the coast there are other small beautiful beaches that you can have fun exploring. If you like sabbiaci are the Giannella and Feniglia, these are just 20 minutes by car, are equipped and there are many plants with lots of bars and restaurants. Ideal home for those who, after a day at the beach you want to devote to relax enjoying the beautiful colors of a sunset over the sea maybe making a nice barbecue made available for guests. In property Lucia you find the warmth and tranquility. Ideal for those seeking a holiday away from the chaos. The Monte Argentario offers, in addition to the beautiful sea, many paths for lovers montanbike and trekking. Nearby is the golf course, tennis. In the village you can rent, even daily, dinghies or sailing boats with skipper. For those wishing to introduce the sport to children on Giannella organize surfing courses, winsuf and sailing. Chiamatemi, posso applicare sconti od offerte in base al periodo e al numero delle persone. Si applica 10€ a persona per la biancheria.